Ima Keithel is over 500 years old, and has around 5,000 vendors – all of them women. Goods for sale at Ima Keithel. Photo credit: Arijit Nag. 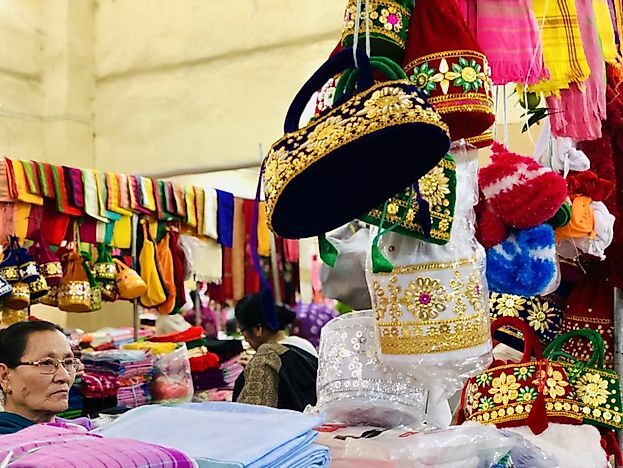 In the heart of the city of Imphal in the Indian state of Manipur lies a unique bazaar that epitomizes female empowerment. Called “Ima Keithel” or the “Mother’s Market,” it is the largest all-women market in Asia, if not the entire world. Ima Keithel is over 500 years old and has around 5,000 traders selling everything from fruits and vegetables to groceries and fish, and even handmade jewelry and textiles. What distinguishes this market from most other large bazaars around the world is the fact that all of its traders are women. Every visitor to Imphal is directed to this star attraction of the city. The crowded market place might overwhelm the first-time visitor. However, the spirit of Ima Keithel would soon woo all with its charm. It is the pride of Manipur, the symbol of its culture. The vibrant Ima Keithel in Imphal. Photo credit: Arijit Nag. It is not only trade that defines Ima Keithel. The place is steeped in history. According to scholars, the market originated in the 16th century. At that time, an ancient forced labor system called the Lallup-Kaba was prevalent in Manipur. The men of the region were sent off to faraway lands to fight wars or to cultivate fields. The women, however, stayed back with the children and replaced men in their traditional roles. The women now grew crops in their own fields and sold the produce in improvised marketplaces. Over time, organized women-run markets, including the Ima Keithel, came into being. During the British occupation of Manipur, the women of Ima Keithel exhibited great bravery. They joined hands with other women across the region and waged a war called the Nupi Lan or the “Women’s War” in 1939. It was a fight against the oppressive British policies and commercial reforms that would lead to economic losses for the people of Manipur. Traditional manipuri shawls and bags sold by the women traders of Ima Keithel. Photo credit: Arijit Nag. 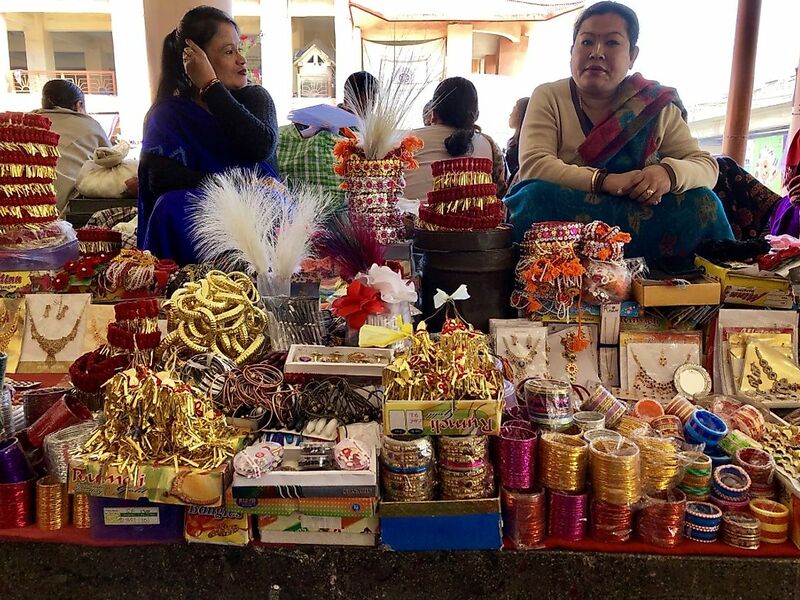 Ima Keithel is often the primary stop for traditional manipuri wedding shopping. Photo credit: Arijit Nag. The women of Ima Keithel organized mass demonstrations, rallies, and blockades to demand justice for their people. In order to end the agitation, the British left no stone unturned. They even tried to sell off Ima Keithel to foreigners. However, the women stood their ground in the face of great adversities and managed to hold on to their beloved market-place. Since then, Ima Keithel has been the seat of socio-political discussions and debates. It has represented the great power that lies within the unity of women. Ima Keithel comes to life every morning. Only married women are allowed to trade in the market. They come from diverse ethnic groups, and they come from far and wide. They can be seen dressed in their colorful traditional garments of phaneks (a sarong-like garment) and innaphis (shawls draped around a blouse). A myriad of sounds ranging from the laughter and gossips of its women traders to the haggling between buyers and sellers fills the air of the heavily crowded Ima Keithel. As evening approaches, the sounds turn dimmer and the women prepare to return to their homes, often in remote villages several miles away. The women of Ima Keithel have also formed a union that oversees the affairs of the market. It also has a credit system that allows women to borrow money to purchase goods. At Ima Keithel, it is one big family of strong, empowered women. They are not only masters of their trade but also socially and politically aware. The camaraderie exhibited by these women is heart-warming. The success of the women of Ima Keithel is living proof of the fact that there is nothing called a "man's world" or a "woman's world". It is only the will to do something that matters the most.